Don't forget to check our Facebook page to be up to date with clinic goings on!! We now have Karma at the clinic Tuesday and Thursday 1:30 - 8:30 and Saturdays 10 - 4 pm. He has a background in manual and sport therapy and has a Bachelor's and Master of Physiotherapy. He also is IMS (Dry Needling) trained. Call for an appointment or book online. Jodh is in India at this time but we have Carole covering the Tues/Thurs/Sat shifts! Come and meet her! Our new Stortz MP 100 shockwave therapy machine has arrived! Our new Shockwave therapy is coming......stay posted! And online booking! Like us on Facebook: We are much more up to date there!! Jodh and his wife have a healthy baby boy. Congratulations!! John and his wife have just had baby number 4 arrive last night! At 8 lb 11 oz, he is a healthy baby boy! Congratulations! Baby Drea has arrived at 9 lb 3 oz September 6, 2016! Congratulations! Mhairi is now on maternity leave. We are all waiting for her new baby girl's arrival! We will keep you posted. It is National Cupcake Day at Anson. Come by and donate to the BC SPCA and get a homemade cupcake!! We now have two physiotherapists to help you on Saturdays! Both Armin and Jodh are available for Saturday appointments now! This is what you were asking for....and now you have it! They both have great hair. it appears to be an exclusive club tho. Her exercise program is really helping her keep the weight off. Quite the technique she is sporting as well. Jodh is here to help. ....Guess who's coming to Anson? I am a Certified Nutritional Practitioner. On my way to becoming a health practitioner, I attended Capilano University and achieved a paralegal diploma. I worked in the legal field for 10 years in Vancouver helping people address a variety of motor vehicle injuries, navigate insurance coverage, employment disability, specialist appointments and the BC health care system. Coming to the end of my time in the legal field, I had my own struggle with health. To make a long story short, I fell through the cracks of the medical system and decided I needed to make a change and become more proactive in my own health. I was inspired to pursue a more holistic way of living while continuing to help people, so I attended the Institute of Holistic Nutrition and graduated with First Class Honours and was voted class valedictorian. I’m passionate about educating people about the amazing things food can do for us, our bodies and our overall health. I love Yoda, and am currently in a relationship with avocados . What is a Holistic Nutritionist? Holistic Nutrition is the practice of approaching the health of an individual as a whole, including physical, mental, emotional and lifestyle considerations. A Holistic Nutritionist focuses on education and implementation of a proper diet of nutrition, for optimum health with adjuncts of holistic supplements and food nutrients to assist chronic health conditions. We work together towards your goals and make changes one step at a time, to create positive lasting change. I conduct one on one consultations in person, over the phone and via Skype. I currently have clients both locally and abroad. I use assessment tools and can provide meal plans, fun health challenges, grocery shopping tours, and recipes - all based on your individual needs. Some reasons you may want to hire a nutritionist: have better sleep, address nutritional deficiencies, increase energy, better digestion (including reduce bloating and gas), improve mental clarity and alertness, reduce anxiety and brain fog, improve allergies and hormonal balance, better skin - this is just the beginning! Learn how to eat for your lifestyle, and learn how to ward off diseases and symptoms rather than managing them! Imagine a life where you can thrive. 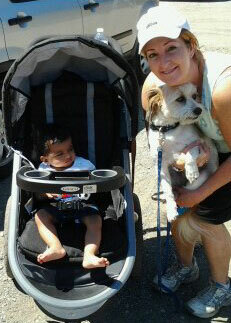 ....Ronan, Wally and Lori out walking. Ronan continues to grow and change. Ronan will soon be taller than Lori. 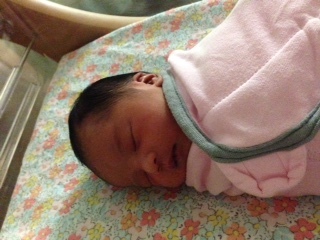 .... Baby Amelia has arrived! She is 6lbs.13oz. She was born on Sunday June 7, 2015. Both Natalie and Amelia are doing well. .....Trish, when is she leaving and how does that affect you? A lot of you have been asking when is Trish leaving, who will replace her and who are you going to see. Trish is leaving at the end of June 2015. As far as replacing her, it can't be done. Any of you who see Trish know that she is irreplaceable. However we are making every effort to find a physiotherapist with the right training and personality to join our amazing team of university trained and registered physiotherapists. We are excited to have this growth opportunity and invite you all along for the ride. We hear you. We will be open every 2nd Saturday starting February 14th! Nothing says love like physiotherapy. Come celebrate Valentine's Day with us. Mhairi will be here from 9-1. One less thing for you to do, leave the billing to us. Pacific Blue Cross will pay us what they pay you and all you pay is the balance, if any. Talk to Linda if you have any questions. It is with great sadness that I write this entry. Reddy passed away peacefully last night in hospital. Not only is this a loss to all of us who knew her but I really feel that we have lost an earth angel. Her laughter was infectious. She always had a smile on her face and a good thought about everyone. She will be sorely missed. She leaves her newborn son Ronan and her husband Raj. "Our eternal spiritual self is more real than anything we perceive in this physical realm, and has a divine connection to the infinite love of the Creator." ©2015 Lori Dalin Physical Therapist Corporation DBA Anson Orthopaedic and Sports Physiotherapy Clinic. All Rights Reserved.